Former Secretary of Transportation swears in JACL National Board membes (from right) Gary Mayeda, Michelle Amano, Jeffrey Moy, Matthew Farrells, Kota Mizutani, Sheldon Arakaki, David Unruhe, Roberta Barton, Janet Komoto, Betsy Sato, and Scott Nakamura. 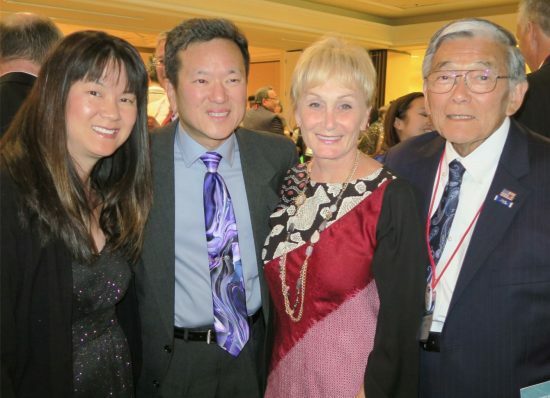 LAS VEGAS — The Japanese American Citizens League elected and installed its National Board for the 2016-2018 biennium on July 14 during the JACL National Convention, held at the Monte Carlo Resort and Casino in Las Vegas. Gary Mayeda, a member of the APAN (Asian Pacific American Network) Chapter who has previously served on the National Board, was elected president, succeeding David Lin. Mayeda and the new board were sworn in by former Secretary of Transportation Norman Mineta with ABC7 news anchor David Ono serving as emcee. Mayeda’s candidate statement reads, in part: “Having served in a volunteer leadership position in many community non-profit organizations for nearly 40 years, I have a lot to give the national leadership of JACL. 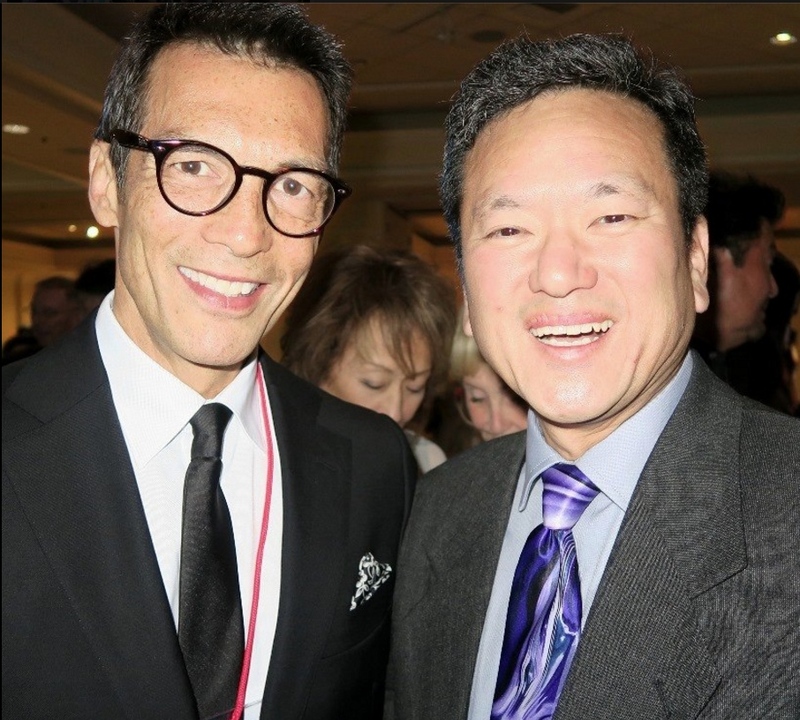 Newly elected National JACL President Gary Mayeda (right) with ABC7 news anchor David Ono, who emceed the installation. “Volunteerism started in high school participating in the student body leadership at Eagle Rock High School in Los Angeles … As a college student at California State University, Northridge (CSUN), I was on the leadership of three student organizations and founded two of them. “The JACL experience for me was one that emphasized service through leadership. The curiosity started when I attended my first National Board meeting in September of 1990 with Lillian Kimura as president. “Having served on the National Board from 1996 to 2002, I’ve seen first-hand how issues affect districts differently and to be sensitive to them. Serving on nearly every Convention Committee as well as assisting in writing amendments to the National Constitution and Bylaws helped to me understand the organization’s inner workings. “JACL needs to attain financial stability and sustainability. Using every tool such as personal partnerships and Pacific Citizen advertisers we can develop financial relationship with people that need our outreach and historical knowledge of the APA experience. We need our assets to work for us and we need to coordinate that so that every arm of JACL knows what the other arm is doing. National JACL President Gary Mayeda and his wife, Chris Vuu Mayeda, with former Secretary of Transportation Norman Mineta and his wife, Deni. Mayeda is a consulting engineer in El Segundo, working on building MEP (mechanical, electrical and plumbing) systems, also called HVAC (heating, ventilation and air conditioning). He is senior associate/project manager for Infrastructure Consulting Inc. and has been in the business for more than 30 years. All of the candidates ran unopposed. Pacific Southwest District Council (PSWDC) Governor Michelle Yamashiro was unable to attend.